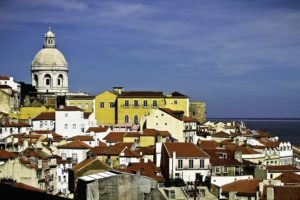 Europe’s westernmost capital city, Lisbon was founded by the Phoenicians; it had become a crucial trading port and centre for Portuguese exploration by the 15th century. The city’s appearance was determined by its seafaring history and the rebuilding of Baiza, its centre, following the 1755 earthquake. The richness and diversity of Lisbon’s art and architecture will be the focus of the study tour: from the Moorish Alfama district, the Romanesque cathedral and the Castle of Saint George to the Chiado museum with its outstanding collection of modern art and the Calouste Gulbenkian museum, one of the largest private art collections in the world. The Belem district is the setting of many of the city’s iconic sites: the Jeronimus Museum, the Discovery Monument and the Ajuda Palace. The Azulejos museum is one of the most important national museums: we shall examine its collection of uniquely Portuguese tiles and admire its location within a 16th century convent. 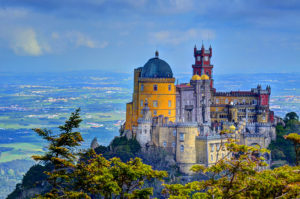 The tour will include a visit to the nearby town of Sintra, which according to UNesco is the first centre of European Romantic architecture: among the palaces worth visiting are the Royal Palace famous for its facing with Azulejos, the Pena palace (image on the left) in which Moorish Gothic and Renaissance features combine and the 19th Monserrate Palace built for the English merchant and art collector Sir Francis Cook in an eclectic style. 5 nights at the Hotel Convento do Salvador***, set in a former convent and located in the historical neighbourhood of Alfama. Bed and Breakfast tariff in twin-share room with private facilities. £688, inclusive of tuition, airport transfers, day visit to Sintra, accommodation and breakfast. Ca. £200 scheduled flights from London to Lisbon. Note that this is an estimate (if it is less you play less), please see Booking Conditions for more information concerning nominated flights. Airport transfers and visit the UNesco site of of Sintra by private minibus. Dalila Castelijn has a degree in foreign languages and literature from the University of Trieste, Italy and BA in history of art and architecture from Birkbeck College, London. 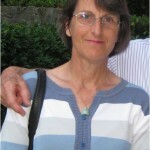 She specializes in art and architecture of the Renaissance in Europe and has taught for the OU and the WEA. Courses taught for the OU include A216, A354 , A424 and, currently, AA315. She has led art study tours to Italy with the School of Continuing Education, Reading University.